NAVY AWARDS IRONHAWK CONTRACT FOR LITTORAL COMBAT SHIPS – Ironhawk Technologies, Inc.
Los Angeles, CA. – September 16, 2015 – Ironhawk Technologies, Inc. is pleased to announce that it has been awarded a contract as the Prime Contractor to integrate Ironhawk’s SmartSync® Data Distribution Software and Technology Platform onto the U.S. Navy’s Littoral Combat Ships. The Littoral Combat Ship (LCS) Program has tasked NSWC PHD, Code L24 with the implementation of a Condition Based Maintenance + (CBM+) solution for the LCS Combat System Elements. Condition-based maintenance was introduced to try to maintain the correct equipment at the right time. CBM is based on using real-time data to prioritize and optimize maintenance resources In line with this goal, there is a requirement to replicate CBM+ data from the ship to NSWC PHD for post analysis by engineers. SmartSync® developed by IRONHAWK is a data compression software which will enable the transmission of this data from ship to shore over a bandwidth constrained connection. Due to the unique aspects of the SmartSync® product, by purchasing this DON Application and Database Management System (DADMS) approved product and corresponding professional services to integrate the product, LCS will be positioned to utilize a supported product that is wholly appropriate for other Navy and Department of Defense users regardless of the operating systems and the data formats utilized. 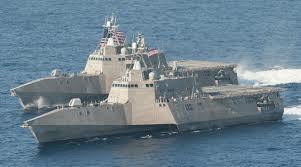 The Littoral Combat Ship (LCS) is the first of a new family of surface ships for the United States Navy. The LCS is a fast, highly maneuverable, networked surface combat ship designed to satisfy the urgent requirement to operate in the shallow coastal waters to counter growing potential threats of coastal mines, quiet diesel submarines and the potential to carry explosives and terrorists on small, fast, armed boats. The numbers of LCS ships is not finalized but there has been speculation of 56 or up to 60 LCS ships, within a total US naval fleet of 375 ships. Ironhawk’s mission is to deliver decision critical data throughout the last tactical mile to the tip of the sword over narrow band satellite communication networks. Its customers include major branches of the U.S. Armed Forces, and several of the largest defense contractors and systems integrators. The cornerstone of Ironhawk’s solution is its SmartSync® DCS Platform, which integrates compression, transport, synchronization and content management, thus enabling the fast delivery of heterogeneous, complex data across the global theater.